All sales are in millions of dollars except EPS. According to company leaders, Novartis reimagines medicine to create transformative treatments in areas of great medical need and find new ways to deliver them to people worldwide. 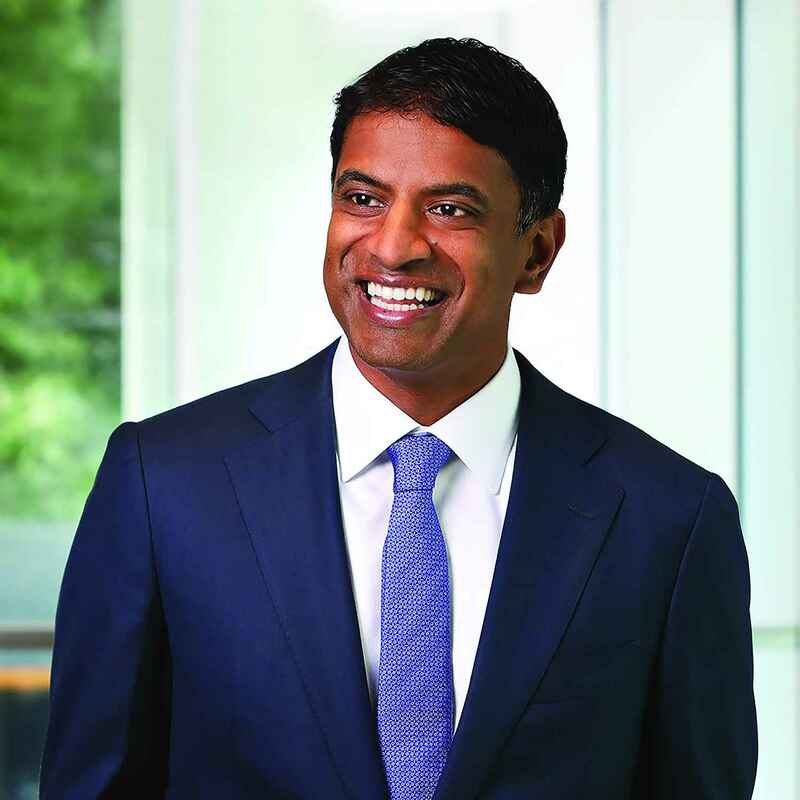 Novartis continues to execute this strategy by pursuing five priorities: operational execution, breakthrough innovation, data and digital leadership, restoring the company’s reputation to be a trusted stakeholder in society, and the transformation of its culture. Novartis took actions during second-quarter 2018 that reflect this strategy and the capital allocation priorities. The company concluded the strategic review of Alcon, determining that a proposed 100 percent spinoff is in the best interest of shareholders and consistent with the Novartis strategy of focusing as a leading medicines company. The planned spinoff would create the leading eye-care device company globally. Mike Ball became Chairman-designate and Alcon COO David Endicott took over as the company’s CEO on July 1st. Additionally during the second quarter, Novartis completed the sale of the organization’s stake in the GSK consumer healthcare joint venture for $13 billion. The proceeds are being deployed towards the AveXis acquisition, also completed during the second quarter, and an announced share buyback of up to $5 billion. The company intends to continue paying a strong and growing dividend in Swiss francs, with no adjustment for the intended 100 percent spinoff of Alcon. The planned spinoff would allow Novartis and Alcon to concentrate fully on their respective growth strategies. Novartis’ initiation of a share buyback of up to $5 billion is expected to be executed by year-end 2019. This action is intended to be largely funded via the proceeds of the divestment to GSK of the consumer health joint venture stake, net of the AveXis acquisition payments. Acquired by Novartis in 2011, the Alcon business at the time comprised surgical, vision care and ophthalmic pharmaceuticals. In January 2016, Novartis initiated the process of creating two best-in-class businesses with the transfer of Alcon’s ophthalmic pharmaceuticals to the Novartis Innovative Medicines Division. The leading ophthalmology pharma business will continue to develop as part of Novartis, with 2017 sales of $4.6 billion and the potential blockbuster product RTH258 (brolucizumab) in development for neovascular AMD and diabetic macular edema. Alcon is now fully focused on surgical and vision care. Novartis announced the completed divestment of the company’s 36.5 percent stake in the consumer healthcare joint venture to GlaxoSmithKline on June 1st. The divestment was completed in accordance with the terms of the deal as announced on March 27th and brings to an end Novartis’ participation in the joint venture, which was formed during 2015 as part of Novartis’ portfolio transformation. The completed acquisition of the U.S. clinical-stage gene therapy company AveXis was announced by Novartis on May 15th. Novartis entered into the deal with AveXis on April 9th for $218 per share, representing a total of $8.7 billion in cash. AveXis’ lead product candidate AVXS-101 has the potential to become the first-ever one-time gene replacement therapy for spinal muscular atrophy (SMA), an inherited neurodegenerative disease that results in early death or lifelong disability with considerable healthcare costs. AVXS-101 has received Orphan Drug designation for treating SMA and Breakthrough Therapy designation from the FDA for SMA Type 1. A BLA filing with U.S. regulators is on track for second-half 2018 and a U.S. product launch is anticipated for 2019. PRIME designation in the EU and Sakigake designation in Japan have additionally been secured by Novartis. AveXis offers a valuable gene therapy platform for Novartis, with potential beyond SMA. The AveXis pipeline includes products for Rett Syndrome and a genetic form of amyotrophic lateral sclerosis caused by mutations in the superoxide dismutase 1 (SOD1) gene. Innovative Medicines growth drivers mainly propelled Novartis first-half 2018 net sales growth (+9 percent in US dollars, +5 percent in constant currencies) to $25.85 billion. Net income totaled $9.8 billion compared to $3.64 billion during the 2017 first half, benefiting from a $5.7 billion net gain recognized from the sale of the Novartis stake in the GSK consumer healthcare joint venture and the contribution from the growth in operating income, partly offset by the discontinuation of income from the joint venture. EPS came in at $4.21 during January-June 2018, driven by growth in net income and a lower amount of shares outstanding. The Innovative Medicines Division generated net sales of $17.3 billion (+11 percent, +7 percent cc) in the 2018 first half, as Pharmaceuticals rose 6 percent (cc) and Oncology advanced 8 percent (cc). Volume contributed 12 percentage points to the first-half 2018 sales growth. Generic competition had a negative impact of 3 percentage points largely due to decreased sales of Gleevec/Glivec. Pricing had a negative impact of 2 percentage points, according to Novartis. For Innovative Medicines, a strong U.S. performance ($5.7 billion, up 8 percent cc) was driven by Cosentyx, Entresto and Promacta/Revolade. First-half 2018 sales in Europe ($6.2 billion, +7 percent cc) were spurred by Cosentyx, Entresto and Jakavi. In Japan, sales declined 4 percent cc year-over-year to $1.2 billion versus the prior year, mainly due to the biennial price cut and generic competition. Sales for Emerging Growth Markets rose 10 percent (cc) over first-half 2017 to $4.4 billion. Cosentyx is the first fully human treatment that specifically inhibits IL-17A, a cornerstone cytokine involved in the inflammation and development of ankylosing spondylitis, psoriatic arthritis and psoriasis. First-half 2018 net sales for Sandoz came in at $5.0 billion (+2 percent, -3 percent cc), as 8 percentage points of price erosion – mainly in the United States – were partly offset by 5 percentage points of volume growth. Excluding the U.S. market, net sales rose 5 percent (cc) over first-half 2017. 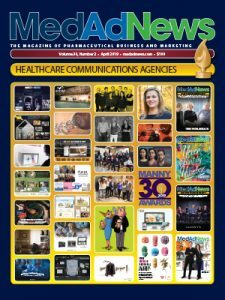 Worldwide sales of Biopharmaceuticals improved 23 percent (cc), mainly driven by Rixathon (rituximab) and Erelzi (etanercept) in the European Union. Alcon net sales for 2018’s first two quarters reached a combined $3.6 billion (+9 percent, +6 percent cc). Novartis management says stock in trade movements represented 1 percent (cc) of growth. Surgical sales rose 8 percent (cc), driven mainly by implantables and consumables. Vision Care sales improved 3 percent (cc) over the one-year-earlier result, driven by contact lenses, including continued double-digit growth of Dailies Total1. According to Novartis, underpinning the company’s financial results in the second quarter of 2018 was a continued focus on key growth drivers. These medicines include Cosentyx, Entresto, Promacta/Revolade, Tafinlar + Mekinist, Kisqali, Jakafi/Jakavi, Lutathera, and Kymriah as well as Biopharmaceuticals and Emerging Growth Markets. Cosentyx sales during the 2018 first half improved 42 percent in USD and 38 percent in CC to $1.28 billion. U.S. growth was propelled by strong demand, and rest-of-world sales produced strong double-digit growth. Novartis announced during May plans to initiate ARROW, a head-to-head study evaluating the mechanistic superiority of direct IL-17A inhibition with Cosentyx over IL-23 inhibition with Tremfya, in patients with psoriatic plaques resistant to treatment with Stelara. The monoclonal antibody Tremfya and the blockbuster biologic Stelara are marketed by Jannsen Biotech. Entresto January-June 2018 sales (+126 percent USD, +119 percent cc) improved year-over-year to $439 million. According to Novartis, new patient numbers continue to grow steadily in the United States. Strong momentum for the product also stems from new post hoc analyses of the PARADIGM-HF clinical study showing the medicine’s effect on quality of life and helping to preserve kidney function. With first-half sales of $549 million (+43 percent USD, +39 percent cc), Promacta/Revolade is on the way to attaining blockbuster status in 2018. Growth at a strong double-digit rate across all regions was propelled by increased demand and continued uptake of the thrombopoietin class for chronic immune thrombocytopenia. Tafinlar + Mekinist is also on track to reach blockbuster status for the first time in 2018, as sales in the January-to-June period came to $551 million (USD 37 percent, cc 31 percent). Continued strong double-digit growth in melanoma and NSCLC across all regions due to increased demand was reported. Kisqali sales for the first two quarters of 2018 amounted to a combined $103 million after a $15 million result during the medicine’s launch period in the 2017 first half. 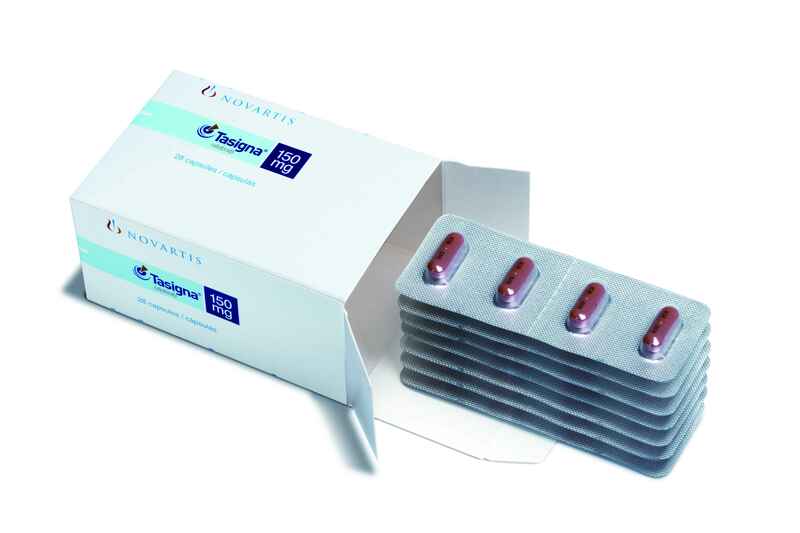 Novartis says Kisqali continues to progress with U.S. growth and launches in some EU countries. Additional EU markets are anticipated to gain reimbursement in the next 12 months and regulatory submissions are under way globally. Sales for Jakavi increased from $348 during the 2017 first half to $473 million in 2018’s first six months (+36 percent USD, +27 cc). Continued strong double-digit growth across all regions was spurred by the myelofibrosis indication and reimbursement of the second-line polycythemia vera indication in additional countries, according to Novartis. Lutathera sales for the first six months of 2018 reached $30 million. Company managers say the Lutathera U.S. launch is advancing well, with more than 50 centers actively treating. Sales for the innovative immunocellular therapy Kymriah in first-half 2018 reached $28 million. FDA approval was obtained for a new indication for the medicine during May 2018, for the treatment of relapsed or refractory (r/r) adult DLBCL patients. For the Sandoz business, global sales of Biopharmaceuticals (biosimilars, biopharmaceutical contract manufacturing and Glatopa) during first-half 2018 rose 23 percent (cc) to $698 million. Europe continued double-digit growth driven by Rixathon and Erelzi, launched during second-half 2017. According to the company, US Biopharmaceuticals was in line with the prior year as strong a strong performance by Zarxio (which is now the share leader in the U.S. filgrastim market) and Omnitrope was offset by lower price on Glatopa 20mg. Based on the first-half performance, Novartis re-confirmed the Group’s full-year outlook as presented at the onset of 2018. Group net sales for full-year 2018 are projected to grow by low to mid-single digits (cc). From a divisional perspective, company leadership anticipates net sales performance (cc) during full-year 2018 to be as follows: growth of mid-single digits for Innovative Medicines; a decline of low-single digits for Sandoz; and growth of mid-single digits for Alcon. 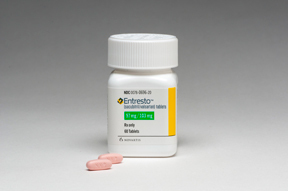 Entresto is a twice-a-day medication that reduces the strain on the failing heart by enhancing the protective neurohormonal systems while simultaneously inhibiting the harmful effects of the overactive renin-angiotensin-aldosterone system (RAAS). Novartis has one of the industry’s most competitive pipelines with more than 200 projects in clinical development, benefiting from a continued focus on innovation, management says. According to the company’s leadership team, Novartis is building one of the most powerful pipelines in the industry with multiple potential blockbusters, and the organization is pursuing strategic collaborations to further strengthen innovation. Kymriah was the recipient of the product’s first European Union marketing clearance during August. The approved indications are for treating pediatric and young adult patients up to 25 years of age with B-cell acute lymphoblastic leukemia (ALL) that is refractory, in relapse post-transplant or in second or later relapse; and for treating adults with relapsed or refractory (r/r) diffuse large B-cell lymphoma (DLBCL) after two or more lines of systemic therapy. Kymriah is the only chimeric antigen receptor T cell (CAR-T) therapy to receive regulatory approval in the EU for these two distinct B-cell malignancies. The product is additionally the first CAR-T cell therapy to win FDA approval. Upon receiving the product’s second U.S. approval to treat appropriate r/r patients with large B-cell lymphoma in May, Kymriah became the first CAR-T therapy to gain FDA clearance for two distinct indications – in non-Hodgkin lymphoma (NHL) and B-cell acute lymphoblastic leukemia (ALL). Kymriah was originally approved by the FDA in August 2017 for treating patients up to 25 years of age with B-cell precursor ALL that is refractory or in second or later relapse. Developed in collaboration with the University of Pennsylvania, Kymriah represents a ground-breaking one-time treatment that uses a patient’s own T cells to fight cancer. Kymriah was designated as an orphan medicinal product and is one of the first PRIME-designated therapies to garner EU marketing authorization. The European Commission clearance in pediatric and young adult patients with r/r B-cell ALL is based on the pivotal Phase II ELIANA study, the first pediatric worldwide CAR-T cell therapy registration clinical trial for Kymriah in children and young adults with r/r B-cell ALL. Another innovative medicine that won EU approval for the first time during the summer of 2018 was Aimovig (erenumab), a first-of-its-kind treatment specifically designed for migraine prevention. Aimovig garnered U.S. FDA clearance for the preventive treatment of migraine in adults on May 17th. Aimovig is the only available migraine prevention treatment designed specifically to block the calcitonin gene-related peptide receptor (CGRP-R), which plays a critical role in incapacitating migraine pain. Aimovig is self-administered once every month through Amgen’s SureClick autoinjector device. Aimovig was the recipient of Swissmedic approval in Switzerland on July 13th and Australian TGA registration on July 3rd. The medicine is the only EMA, Swissmedic, Australian TGA and FDA-approved migraine prevention treatment designed specifically to block CGRP-R. Other regulatory submissions are in progress with other health authorities around the globe. Novartis and Amgen are jointly commercializing Aimovig in the U.S. Amgen has exclusive commercialization rights to the product in Japan and Novartis holds exclusive rights to commercialize Aimovig in the rest of the world. The two companies entered into a global collaboration in August 2015 to develop and commercialize pioneering treatments in the field of migraine and Alzheimer’s disease. The collaboration concentrates on investigational Amgen drugs in the migraine field, such as Aimovig and AMG 301 (undergoing Phase II development). During April 2017, the collaboration was expanded to include joint U.S. commercialization of Aimovig. Novartis and Amgen are additionally collaborating in the development and commercialization of a beta-secretase 1 (BACE) inhibitor program in Alzheimer’s disease. The oral therapy CNP520 – undergoing Phase III development for Alzheimer’s disease – is the lead molecule and further compounds from each company’s pre-clinical BACE inhibitor programs may be considered as follow-on molecules. Kisqali in July became the first CDK4/6 inhibitor to receive FDA approval as a first-line therapy specifically for premenopausal women, and as initial therapy with fulvestrant in postmenopausal women. Marketing clearance was issued by U.S. regulators for hormone-receptor positive, human epidermal growth factor receptor-2 negative (HR+/HER2-) advanced or metastatic breast cancer. A selective cyclin-dependent kinase inhibitor, the drug helps slow the progression of cancer by inhibiting two proteins, cyclin-dependent kinase 4 and 6 (CDK4/6). These proteins, when over-activated, can allow cancer cells to grow and divide too quickly. Targeting CDK4/6 with enhanced precision may have a role in ensuring that cancer cells do not continue to replicate uncontrollably. Kisqali is the only CDK4/6 inhibitor indicated in the United States in combination with an aromatase inhibitor as first-line treatment for pre-, peri- or postmenopausal women with HR+/HER2- advanced breast cancer. Kisqali is also the first CDK4/6 inhibitor indicated with fulvestrant as both initial or second-line treatment for postmenopausal women with HR+/HER2- advanced breast cancer. The July regulatory clearance also represents the first FDA approval using the Real-Time Oncology Review and Assessment Aid pilot programs, as the marketing application was approved in less than one month. Kisqali was initially approved in the United States during March 2017 and in the European Commission during August 2017 as initial endocrine-based therapy for postmenopausal women with HR+/HER2- locally advanced or metastatic breast cancer in combination with an aromatase inhibitor based on findings from the pivotal MONALEESA-2 study. Approved for use in more than 60 countries, Kisqali is not yet available for use in combination with fulvestrant or in premenopausal women in Europe. The drug was developed by the Novartis Institutes for BioMedical Research under a research collaboration with Astex Pharmaceuticals. Novartis is continuing the clinical development of Kisqali in early breast cancer via a collaboration with Translational Research In Oncology. NATALEE is a Phase III clinical study of Kisqali with endocrine therapy in the adjuvant treatment of HR+/HER2- EBC. Novartis’ best-selling medicine in 2017 and first-half 2018, Gilenya, won U.S. marketing clearance in May as the first disease-modifying therapy for pediatric-relapsing multiple sclerosis. Gilenya (fingolimod) was approved for a new indication: the treatment of children and adolescents aged 10 to less than 18 years of age with relapsing forms of multiple sclerosis (RMS). The FDA approval expands the age range for Gilenya, which was previously approved for patients aged 18 years and older with RMS. Gilenya was granted Breakthrough Therapy designation by the U.S. regulatory agency during December 2017 for this pediatric indication. Gilenya is the No. 1-prescribed oral once-daily MS disease-modifying treatment, with worldwide exposure of more than 231,000 patients since the drug’s first approval for adults with RMS. The product is approved in the United States for the first-line treatment of relapsing forms of MS, and in the European Union for adult patients with highly active relapsing-remitting MS (RRMS) defined as either high disease activity despite treatment with at least one DMT, or rapidly evolving severe RRMS. The Tafinlar (dabrafenib) + Mekinist (trametinib) combination obtained U.S. marketing clearance in April for a new indication: for the adjuvant treatment of patients with melanoma with BRAF V600E or V600K mutations, as detected by an FDA-approved test, and involvement of lymph node(s), following complete resection. The FDA granted Tafinlar + Mekinist Breakthrough Therapy Designation for this indication in October 2017 and Priority Review during December 2017. Tafinlar + Mekinist was granted a new indication by the European Commission in August: for the adjuvant treatment of stage III patients with BRAF V600 mutation-positive melanoma after complete surgical resection. This marketing clearance represents the third for Tafinlar in combination with Mekinist in Europe across a variety of tumor types identified with a high level of BRAF mutation. Combination use of Tafinlar + Mekinist in patients with unresectable or metastatic melanoma who have a BRAF V600 mutation is also available in Japan, Australia, Canada and other countries. The combo therapy is additionally approved for treating metastatic non-small cell lung cancer with a BRAF V600E mutation in the United States and advanced NSCLC with a BRAF V600 mutation in the European Union. The medicines are also indicated in more than 60 countries, including the United States and European Union, as single agents for patients with unresectable or metastatic melanoma with a BRAF V600 mutation. Tafinlar and Mekinist target different kinases within the serine/threonine kinase family – BRAF and MEK1/2, respectively – in the RAS/RAF/MEK/ERK pathway, which is implicated in NSCLC and melanoma, among other types of cancer. When Tafinlar is used with Mekinist, the combination has been demonstrated to slow tumor growth more than either drug alone. The drug combo is being studied in a clinical trial program across a range of tumor types performed in study centers around the world. The blockbuster leukemia drug Tasigna (nilotinib) received FDA clearance via Priority Review for an expanded indication during March. The U.S. regulatory agency approved the product’s indication to include treatment of first-line and second-line pediatric patients 1 year of age or older with Philadelphia chromosome-positive chronic myeloid leukemia in the chronic phase (Ph+ CML-CP). Worldwide sales for the chronic myeloid leukemia drug Tasigna grew solidly to reach $954 million during the first half of 2018, driven by the product’s performance in the U.S. and Latin American markets. With the FDA approval, Tasigna is now indicated for treating adult and pediatric patients 1 year of age or older with newly diagnosed Ph+ CML-CP. The drug is additionally indicated for treating pediatric patients 1 year of age or older with Ph+ CML-CP resistant or intolerant to prior tyrosine kinase inhibitor (TKI) therapy, as well as adult patients with Ph+ CML in chronic phase and accelerated phase, resistant or intolerant to prior therapy that included imatinib. Tasigna is available in more than 122 countries for treating chronic phase and accelerated phase Ph+ CML in adults resistant or intolerant to at least one prior therapy, including Glivec (imatinib). The medicine is marketed in more than 110 countries for adults with newly diagnosed Ph+ CML in chronic phase. The FDA approved a label update during February for Cosentyx, the first interleukin-17A (IL-17A) inhibitor approved for the treatment of moderate-to-severe plaque psoriasis. The revised label includes Cosentyx (secukinumab) data in moderate-to-severe scalp psoriasis – one of the difficult-to-treat forms of the disease, which affects half of all psoriasis patients. The updated label is based on the proven efficacy and consistent safety profile of Cosentyx from a dedicated Phase III scalp psoriasis study. This follows a similar European label update for Cosentyx in June 2017. 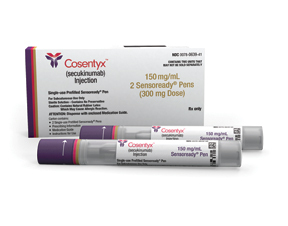 Cosentyx is the first fully human IL-17A inhibitor approved for treating psoriasis, psoriatic arthritis (PsA) and ankylosing spondylitis (AS). The blockbuster medicine is a targeted treatment that specifically inhibits IL-17A, a cornerstone cytokine involved in the pathogenesis of psoriasis, and the inflammation of the entheses in PsA and AS. Cosentyx provides psoriasis patients with long-lasting skin clearance, with proven sustainability and safety out to 5 years. The product is indicated for the most hard-to-treat forms of plaque psoriasis – palmoplantar psoriasis (psoriasis of the palms of the hands and soles of the feet), nail psoriasis and scalp psoriasis. Advanced Accelerator Applications, a subsidiary of Novartis, received FDA approval of a new drug application for Lutathera (lutetium Lu 177 dotatate) during January. The product was cleared for marketing for treating somatostatin receptor positive gastroenteropancreatic neuroendocrine tumors (GEP-NETs), including foregut, midgut and hindgut neuroendocrine tumors, in adults. The orphan drug Lutathera is a first-in-class medicine and the only available FDA-approved Peptide Receptor Radionuclide Therapy (PRRT), a form of treatment comprising a targeting molecule that carries a radioactive component. Novartis completed a tender offer for Advanced Accelerator Applications (AAA) in January for a price of $41.00 per Ordinary Share and $82.00 per ADS. The completed offer for the radiopharmaceutical company AAA, which develops, produces and commercializes Molecular Nuclear Medicines, bolsters Novartis’ oncology portfolio. The FDA accepted the supplemental New Drug Application and granted Priority Review designation to Promacta in combination with standard immunosuppressive therapy (IST) for first-line treatment of severe aplastic anemia (SAA), Novartis announced in May. The oral thrombopoietin receptor agonist Promacta (eltrombopag) is marketed as Revolade outside the United States. Promacta is already marketed for SAA in the refractory setting for patients who have had an insufficient response to IST. The medicine is additionally available for adults and children with chronic immune thrombocytopenia (ITP) for patients who are refractory to other treatments and for treating thrombocytopenia in patients with chronic hepatitis C virus (HCV) infection. During October, Novartis announced the accepted regulatory filing of siponimod (BAF312) for secondary-progressive MS by U.S. and EU health authorities. If cleared for marketing, siponimod would be the first oral disease-modifying therapy with the potential to delay progression and expand possibilities for SPMS patients. Novartis says the new drug candidate is on track for U.S. market clearance in March 2019 and EU approval in late 2019. As a global leader in generic pharmaceuticals and biosimilars, Novartis’ Sandoz division is pioneering novel approaches to help people around the world access high-quality medicine. Sandoz is the first pharma company to win regulatory approval of a biosimilar in Europe, Japan, and the United States. As of September, Sandoz had two biosimilar medicines approved in the United States. Management says the company has the leading biosimilar pipeline and plans to launch several biosimilars of major oncology and immunology biologics during the next few years. Novartis agreed during September to sell selected portions of the Sandoz U.S. portfolio – specifically the U.S. dermatology business and generic U.S. oral solids portfolio – to Aurobindo Pharma USA for $900,000 of cash plus $100,000 of potential earn-outs. According to the company, this transaction supports the Sandoz strategy of concentrating on complex generics, value-added medicines and biosimilars to achieve sustainable and profitable growth in the United States over the long term. The Sandoz U.S. portfolios to be sold to Aurobindo include 300 products and additional development projects. The sale additionally includes the Sandoz U.S. dermatology development center. The Sandoz biosimilar Hyrimoz (adalimumab) received European Commission marketing clearance in July. The product was granted EU marketing authorization for use in all indications of the reference medicine, including rheumatoid arthritis (RA), plaque psoriasis, Crohn’s disease, uveitis and ulcerative colitis. Adalimumab is the active chemical in the world’s best-selling prescription medicine Humira. Hyrimoz is an inhibitor of tumor necrosis factor (TNF), a protein that is overproduced in certain autoimmune conditions, resulting in inflammation and tissue destruction in joints, mucosa or skin. Hyrimoz is Novartis’ seventh biosimilar medicine to receive approval in Europe. Other biosimilars for oncology and immunology indications are anticipated to launch worldwide across major regions by 2020. Sandoz received European Commission approval for a biosimilar version of another TNF-alpha blocker in May. Zessly (infliximab) was issued approval for use in all indications of the reference medicine including RA, adult Crohn’s disease, pediatric Crohn’s disease, adult ulcerative colitis, pediatric ulcerative colitis, AS, PsA, and plaque psoriasis. Infliximab is the active ingredient in the blockbuster brand Remicade. The Zessly marketing clearance represented the third European Commission approval for a Sandoz biosimilar within 12 months. On the generics front, Sandoz announced during February the U.S. regulatory approval and launch of Glatopa (glatiramer acetate injection) 40 mg/mL as a fully substitutable, AP-rated generic version of the blockbuster multiple sclerosis medicine Copaxone. Teva Pharmaceutical Industries markets Copaxone as a three times-a-week therapy for relapsing forms of multiple sclerosis. Glatopa was developed through a collaboration between Momenta Pharmaceuticals and Sandoz, and is produced in the United States.